One Christmas over 25 years ago, a friend who enjoyed calligraphy sent me a calendar with quotations which she had skillfully penned. I could not bear to discard them at the end of the next year, so I saved the art and eventually had four of them framed. 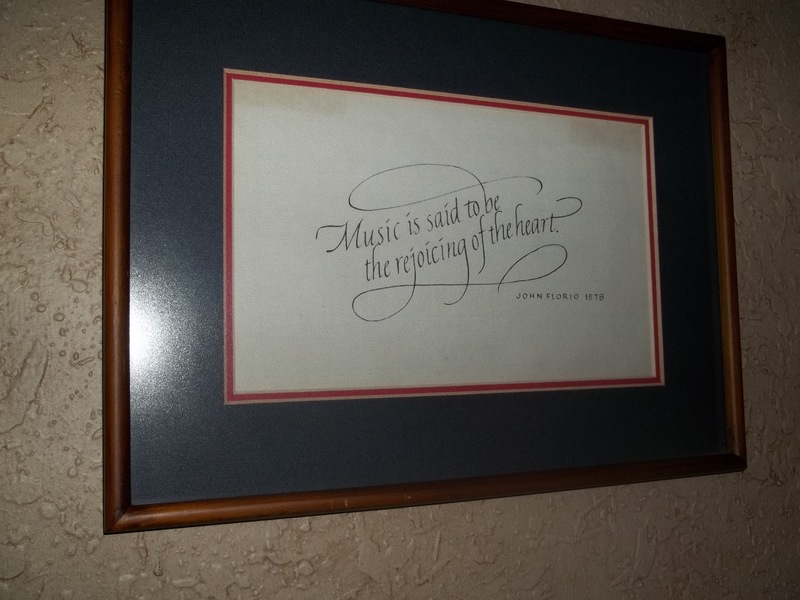 They still hang in our living room where they are reminders of friendship and generosity, but also of the way music is experienced and valued in our home and hearts. Thank you, Nancy. Texas Gulf Coast Winters are frequently mild, but so far this year has been strangely so. After the summer’s dreadful prolonged heat and drought, we welcomed Fall and cooler temperatures. After earlier than usual temperature dips into slightly below freezing, we have had only a couple of freeze warnings and unusually warm days which are tricking the garden into thinking Spring. The Peggy Martin roses on our arbor are throwing out new growth and bursting into a riot of color. Undoubtedly we will have some nips when temperatures drop again. How can I learn and grow from tending this garden? I will remember that my circumstance is not always what it seems. I will avoid jumping to conclusions based on unfinished results. I will remember my Gardener knows the forecast. 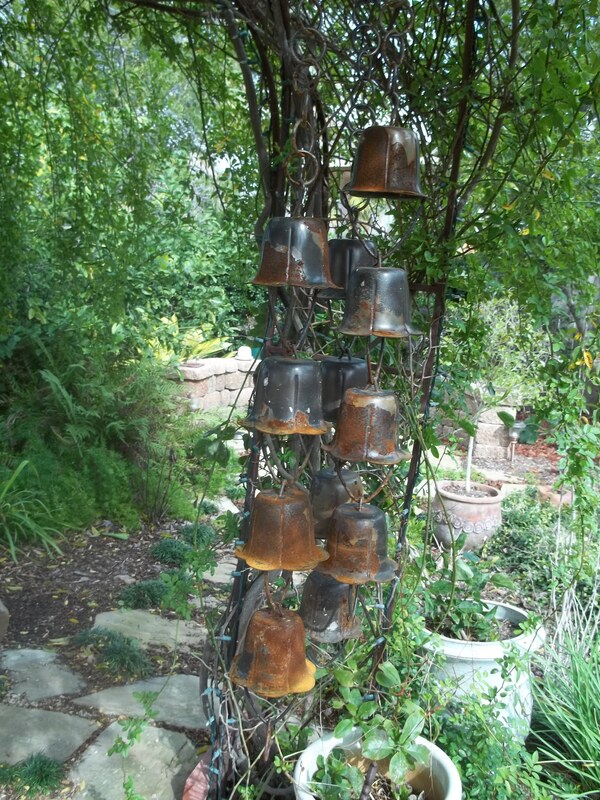 This string of bronze bell shaped objects is hanging right now from one of the arches in our rose arbor by the fish pond. It is pretty, and if breezes get brisk, it sounds like a clattery windchime. It is OK as this ornament. But it is not functioning in the way it was designed. These “bells” are supposed to be cups. The cluster is intended to hang in one long string to replace a traditional gutter downspout. It is called a rain chain and is supposed to be a beautiful and functional alternative to a plain downspout. 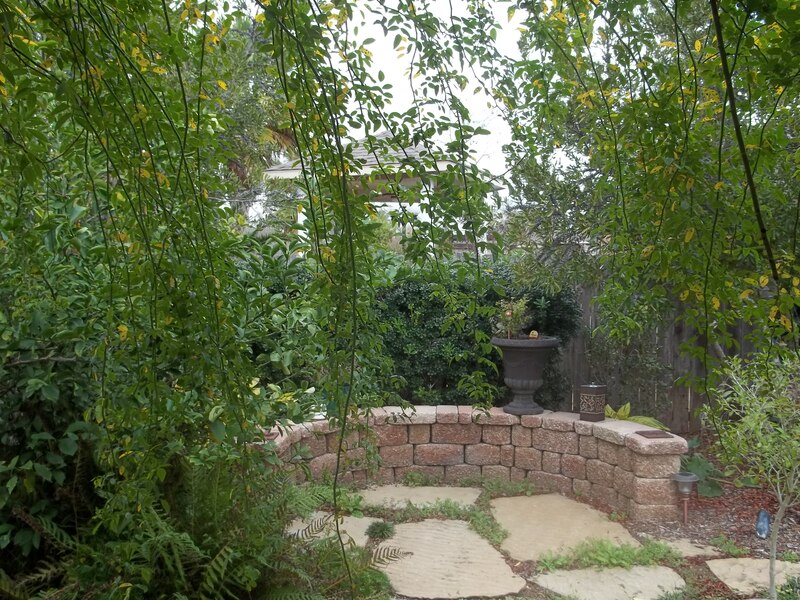 This was my gift to my husband one year when I read that the cups would visibly guide rainwater from the roof to the ground and transform our gutter into a pleasing water feature. I did not realize that because our gutters are tied via the downspouts into a French drain system, we would not be able to hang the rain chain instead. So we do not hear the soft tinkle of individual rain drops or a soothing rush of water. The upside down cups clink and will never collect raindrops. Is there a purpose for which I am intended that is blocked by any upside down choices I make? At the beginning of a new year, I am not so much making resolutions as I am considering how I spent myself and a year’s worth of time in the year just past. That leads to choices about spending time and personal resource in the present. What do I need to keep or change in order for me to honor God, delight in His presence, and show my love to others in ever growing ways? As I mulled these thoughts while packing away Christmas lights and garland, clearing table tops and starting the cleaning tasks which accompany taking down decorations, I saw the disappointing results of a gardening project I began around Thanksgiving. Every year, I enjoy placing Paperwhite Narcissus bulbs into containers with stones and water. They put down roots, send up green shoots, and always delight us with fragrant white blooms before Christmas. 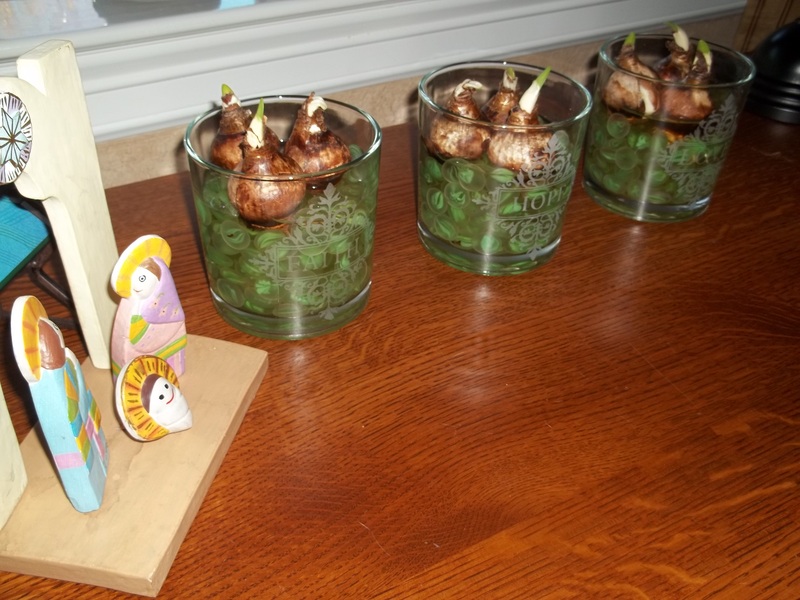 Most of the bulbs offered beginning shoots of green. Some grew a few inches. But none of them bloomed by Christmas, and in general failed to thrive. Now, only one bulb appears to have the small swelling at the base of its leaves that tells me a flower may eventually unfurl. I decided to remove the bulbs. That is when I discovered that they never grew any roots. Only the ones with more than an inch or two of leaf had grown the plump white roots which could reach down into the water for necessary nutrients. Beginning was all they did; then lacking roots and healthy growth they began to decay. That was an epiphany moment for me. No matter how full I am of possibility and fresh starts, I can never grow if I am not rooted and absorbing the nourishment necessary to flourish. “Feeding myself” is never on a daily to do list. But I realize I have little to offer others if I don’t choose healthy foods and activity for my body as well as take the time to begin my days with quiet time which feeds and grows my soul. I love listening to a John Michael Talbot album called “Come to the Quiet” each morning. As I listen and worship, I am fed. My roots spread and deepen. I stretch and grow. I can bloom!